Before going to Geirangerfjorden, we went on the top of dalsniba. 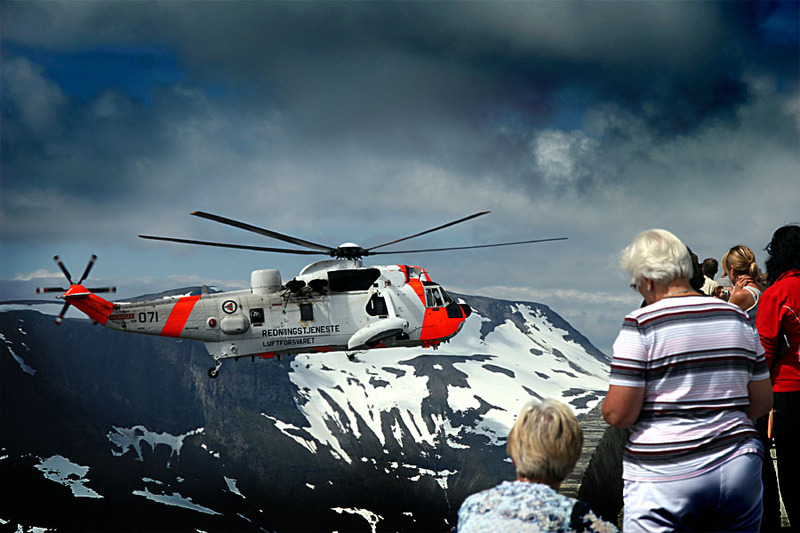 It is a mount over the fjord with a parking with a panoramic view. The view there was just amazing embracing all the fjord and the tiny village of Geiranger that stands at the end of the fjord 1500 meters below. And then suddenly came this helicopter. It flew all over the area for about 1 hour. I had the chance to test the burst mode of the camera to freeze the motion of the machine. Sadly, we heard that the rescue team was looking for someone lost in the mountains, lost over the high cliffs in the area. We saw in the newspaper the next day that they found a young woman that felt in the rocks. It was a shock that this sad accident happened in such a wonderful place.